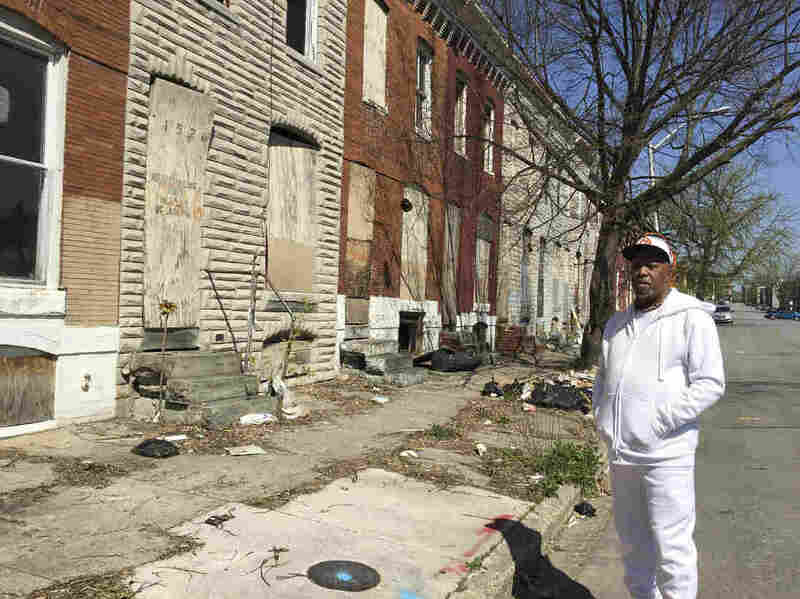 In Baltimore, Hopes Of Turning Abandoned Properties Into Affordable Homes The city has long suffered a dearth of decent housing. The recent collapse of vacant buildings — which in one case killed a man — has increased the urgency of finding a solution. Marvin Cheatham, president of the Matthew Henson Neighborhood Association, stands in front of a row of abandoned homes in West Baltimore. He would like to see them torn down and replaced by a food market, a senior center and a health clinic — all of which the neighborhood currently lacks. Baltimore's poorest neighborhoods have long struggled with a lack of decent housing and thousands of abandoned homes. Things recently took a turn for the worse: Five vacant houses in the city collapsed in high winds several weeks ago, in one case killing a 69-year-old man who was sitting in his car. 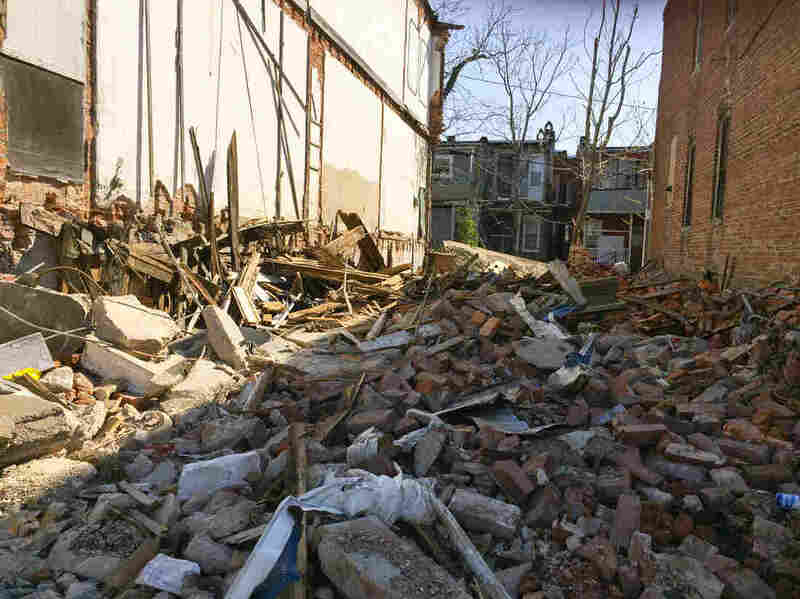 The city needs to do more about decaying properties if it wants to revitalize neighborhoods like those where Freddie Gray grew up, says Marvin Cheatham, president of the Matthew Henson Neighborhood Association in West Baltimore. Gray's death — of a severe neck injury sustained in police custody over a year ago — led to riots in Baltimore and calls by protesters for more jobs, new housing and better schools to address extreme poverty in the area. One of the rowhouses that collapsed recently was on a small block across from the elementary school that Gray once attended. "This was actually a little walkway. This was clear," Cheatham says, pointing to a huge pile of debris. "Now, it's nothing but brick. Brick, wood, mortar, and some aluminum." The debris is piled up between two other townhouses damaged by the collapse. By Cheatham's count, a total of 11 houses on the street are boarded up and abandoned. "Right across from the school. That's what troubles us," Cheatham says. "We want to make certain the kids are uplifted. That they don't come out immediately and see blight. You know, it can't be too encouraging." Cheatham notes that the city has at least 17,000 boarded up and uninhabitable houses. He says the fact that they're there sends a bad message to residents who are also dealing with poverty, unemployment and drugs. One of the abandoned houses that collapsed under high winds in West Baltimore. Paul Graziano, Baltimore's housing commissioner, says he understands why residents are frustrated. But he adds that the abandoned properties "are the product of over 50 years of disinvestment and population loss, so it's not something that's going to turn around overnight or even in a year or two." Graziano says the city has done a lot in recent years with its Vacants to Value program, tearing down or renovating more than 4,000 properties. And he says the effort got a big boost in January, when the city and state pledged another $94 million to raze even more properties. Graziano says some of the cleared lots will become sites for new development, including more affordable housing. Kathy Edin, a sociologist and poverty expert at Johns Hopkins University, credits the city for some innovative programs to encourage development. But for the most part, she says, they've benefited middle class homeowners, rather than addressed what ails the city's poorest neighborhoods. "Almost the sense that you've been abandoned by society because your neighborhood feels so abandoned. That's not really changed," says Edin. "And not much has changed at all in terms of the supply of affordable housing. It's very much the status quo." Gary Dittman, pastor of Amazing Grace Lutheran Church in East Baltimore, is among those who'd like to change that. He's on the board of the Charm City Land Trust, a nonprofit that wants to turn vacant properties into affordable homes. 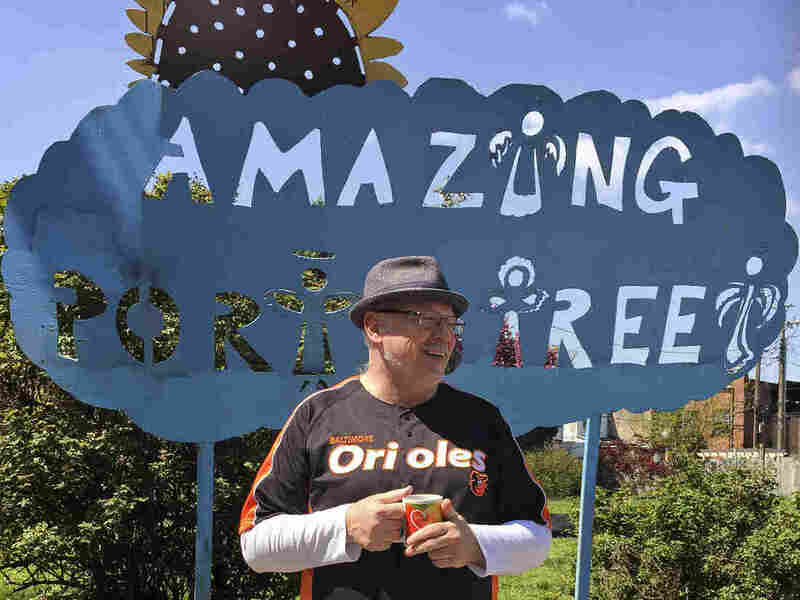 Gary Dittman, pastor of Amazing Grace Lutheran Church in East Baltimore, also works with a nonprofit that wants to turn vacant properties into affordable housing. Dittman says one problem is that outside investors own a lot of property in the city. "One woman that I talked to bought lots off eBay," he says. The trust is trying to preserve the neighborhood for those who already live there. It plans to purchase abandoned homes, renovate them using local workers and sell them at affordable prices to low-income families. 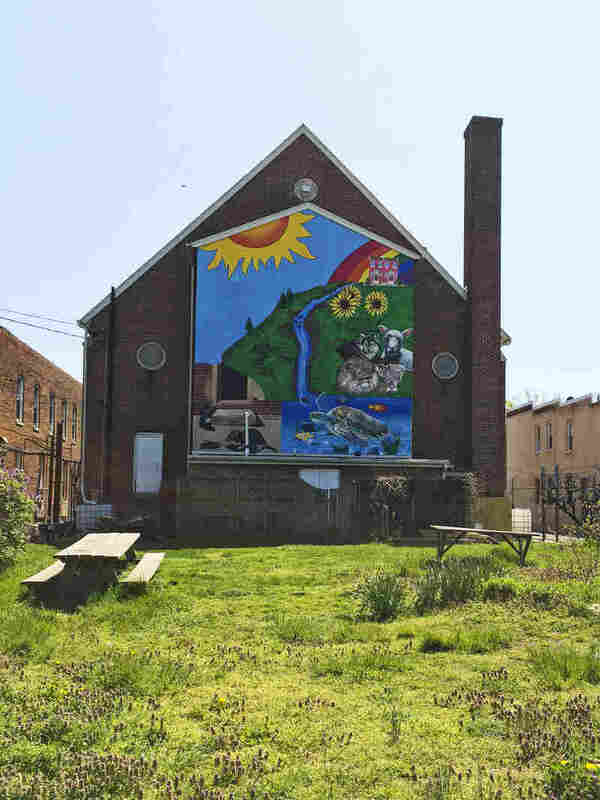 It has already transformed 18 empty lots into a community green space, and just acquired its first abandoned house. A coalition of groups called the Baltimore Housing Roundtable wants to expand the idea. It's calling for $40 million in bonds to create similar trusts to preserve affordable housing and create jobs. A large mural covers the back side of the Amazing Grace Lutheran Church in East Baltimore. It backs onto a park created by the Charm City Land Trust in an area where abandoned homes once stood. Graziano, the housing commissioner, says the city is interested in the plan and is looking into how it might work. Back in West Baltimore, Marvin Cheatham hopes he, too, can tap into some future funds. He'd like to renovate a street right around the corner from where Freddie Gray was arrested. "Put a small food market here, senior center here, health clinic here. The things that we don't have, I think this whole block could do it," he says, pointing to a long row of abandoned homes. Across the street is a weed-covered lot, where Cheatham would also like to build a playground. He says there's not much around here for kids to do. On a recent weekday morning, the street was deserted, except for several young men clustered at the corner. Cheatham says they're gang members selling drugs. "There's about 20 of them. All of 'em 30 and under. Some riding on bikes. The ones that ride on bikes are usually the ones holding the drugs," he says, adding that not much in this area has changed over the past year. Police say they were trying to clamp down on similar drug trafficking when they arrested Freddie Gray.